“The Thanksgiving House” starring Emily Rose airs November 15 on Hallmark Channel. “Christmas Incorporated” starring Steve Lund (the Colorado Kid) airs November 15 on Hallmark Channel. “Best Christmas Party Ever” starring Steve Lund (the Colorado Kid) airs November 20 on Hallmark Channel. 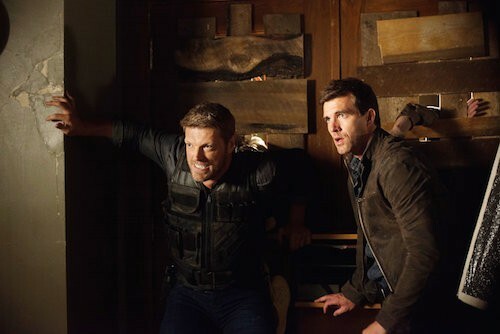 “Merry In-Laws” starring Lucas Bryant airs November 26 on Lifetime. “A Very Merry Daughter of the Bride” with Lucas Bryant and Jason Priestley airs November 27 on Lifetime. Video of Eric Balfour Panel at ComicCon Paris. Article with photos about Eric Balfour and his Electric & Rose clothing line. “The Art of More,” with episodes directed by Shawn Piller, streams November 19 on Crackle. Revisiting Haven interviews with writers Brian Millikin and Nick Parker, and Speed Weed. LOTS of season 5B info directly from the Haven writers. ICYMI – Revisiting Haven on-set interviews about season 5B with cast and crew, including Emily Rose, Lucas Bryant, Jayne Eastwood and Richard Donat, Glenn Lefchak, Shawn Piller and more. Reminder – Visit Syfy.com for lots of Haven goodies, including Inside Haven, Haven Origins, Fun Facts, and Guide to the Troubles. Poor Dave! All that alcohol he’s being forced to drink and I don’t think he’s enjoying it at all! The horseshoe crab with human eyes was back! How many people did Lainey bring back! Mystery man: “You came a long way Duke. All the way to North Carolina. Now that you’re here, come on. What is it you really want to know? Mystery man: “Croatoan came to collect the Troubles from the colonists, but he couldn’t. He wasn’t yet strong enough to escape the Void. So he turned a young Powhatan man into the first Crocker – someone who could collect the Troubles for him. Duke: “And how exactly did great, great, great grandpappy do that? Duke: “So this Croatoan guy created the Crockers to collect Troubles. Why? What did he want with them?